My favorite sale of the year, the Nordstrom Anniversary Sale, begins today! Today (July 12th) is the first day of Early Access for the sale. That means that Nordstrom credit card holders can shop starting today. If you do not have a Nordstrom Credit Card and want to apply for one, you can do so HERE. And if not, no worries! The sale opens to the public on Friday, July 20th. So be sure to book mark my blog and check back then for my top picks. I was able to shop the sale yesterday, and there are SO many great items to choose from! These are all brand new items to the store and the prices will go back up to regular price when the sale is over on August 5th. I will be bringing you a lot of detailed posts about the Anniversary Sale over the next few weeks, so be sure to subscribe to get my blog posts emailed directly to you. If you haven't already done so, just enter your email address where it says "Subscribe" to the right of this post. Today, I am sharing my 12 MUST HAVES from the sale, and will also note the ones that I predict will sell out. 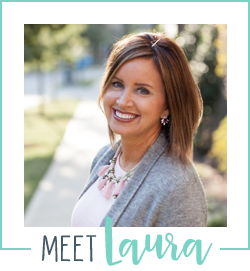 For each of my "must haves", I will share my thoughts on the item, then a picture and sizing information. Last year the Top Shop cardigans sold out fast, and I predict that they will this year as well. I love the oversized fit of this CABLE KNIT CARDIGAN. It comes in several colors and I love it so much that I bought it in both cream and rose! This cardi runs big, so I would definitely size down. The leopard trend isn't going anywhere anytime soon, friends! I love leopard, as y'all know, as it is a fun way to spice up any outfit. There are several leopard shoe options available at the sale. 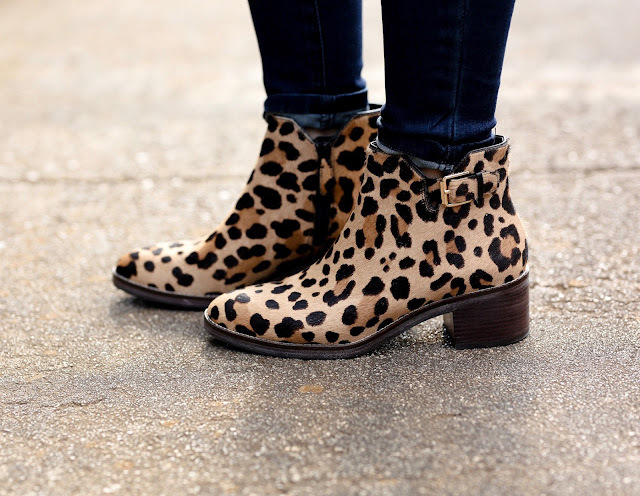 I bought these LEOPARD BOOTIES by Cole Haan and know I will get so much wear out of them. They are comfy and run true to size. 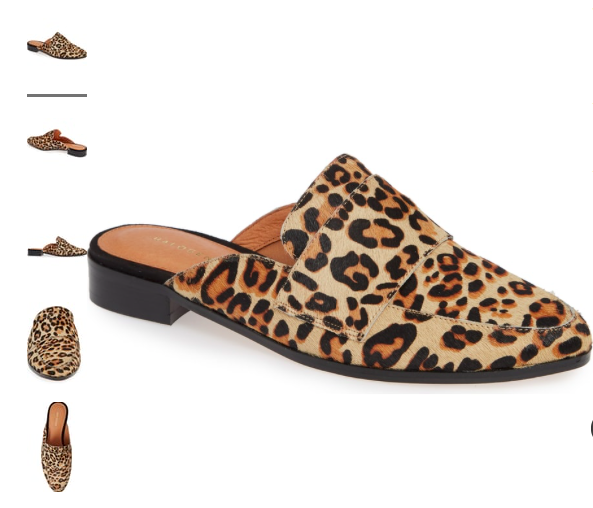 I have last years version of these LEOPARD MULES and love them! They are so easy to slip on and add some fun to your outfit. They run true to size. 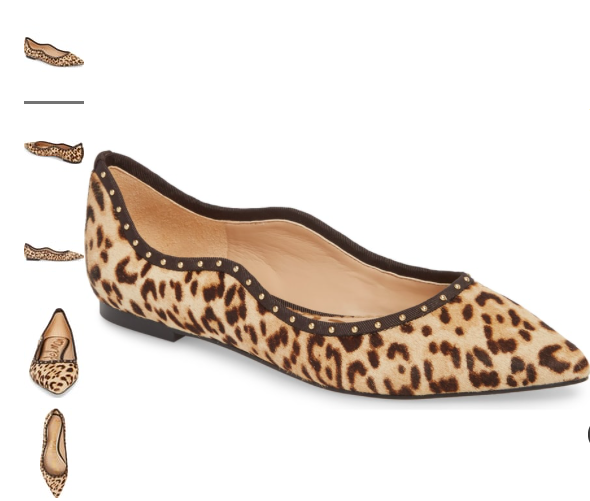 These LEOPARD FLATS are another good leopard shoe option. I love the scalloped edges and the gold studs. These run true to size. Every year, the LEITH CARDIGAN and BP CARDIGAN sell out and I think this year will be no different. They are a great every day staple and both come in so many colors. The Leith option is a little shorter and lighter weight than the BP option. Both are affordable, as the Leith option costs $45 and the BP circle cardi is only $31! Y'all, words cannot express how much I love these CAMO SNEAKERS. The metallic finish, the camo print, the leather laces...so much shoe goodness! These are a little pricier than I usually spend on a casual sneaker, but I know I will get a lot of wear out of them. And, they are $45 off during this sale, so if you love them, now is the time to buy them! They run true to size and are so comfy. They also come in a silver camo print that is cute as well. I predict these will sell out fast as they are so unique. With all the great affordable denim options at the sale, it was hard for me to narrow down my selections! I love these WIT & WISDOM DARK WASH JEANS! They are so flattering and have just the right amount of stretch. I recommend sizing down one size. I love this fun pair of PLAID JEANS BY WIT & WISDOM too! They have the same great fit and a fun plaid print. They also have cute zippers at the waist. I recommend sizing down in these. I also like these DISTRESSED HIGH WAISTED JEANS. They run true to size and have the perfect amount of distressing in my opinion! There are a lot of cross body bags for sale and this style bag is great to wear multiple ways (across your body, over one shoulder, etc...) THIS TORY BURCH BAG is more of an investment piece but is a classic bag that won't go out of style. A similar version of this bag has been a part of the sale the past few years and always sells out. If you don't want to spend as much on a cross body, I really love THIS ONE too that only costs $32!. 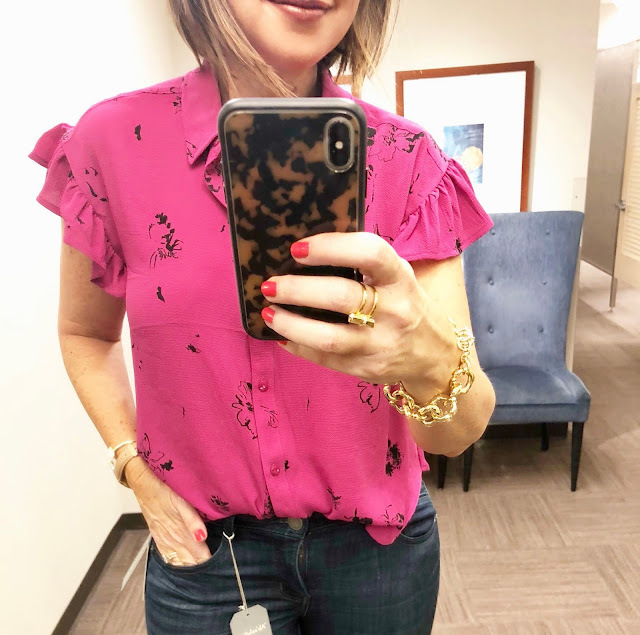 One trend I've noticed this year is a great selection of pretty feminine tops. This BLACK PEPLUM TOP came home with me and I am tempted to order it in white too. This is great to wear now and in the fall under a jacket or cardigan. It runs true to size and has a very flattering fit. I also love this BLACK & WHITE EMBROIDERED TOP. It is light weight and perfect to wear now. It runs large, so I recommend sizing down. Cute with a black skirt or pants for the office, as well as denim. This PINK & BLACK TOP is so pretty! I love the ruffle sleeve detail. It runs true to size, but is a bit short to leave untucked. I recommend pairing it with high waisted jeans or a high waisted skirt. I also love this FREE PEOPLE TUNIC. It has some lace detail that makes it see though in some parts, so you need to wear a cami under it. It runs a bit big, so I recommend sizing down. This LIGHT WEIGHT TOP is perfect to wear by itself or under a cardigan. I chose the light blue color with white checks, and it also comes in several other colors. This top is meant to be a bit roomy, and I went with my regular size. You can see in most of the photos in this post that I am wearing one of 2 delicate necklaces that I bought at the sale. The first is this BLACK & GOLD NECKLACE by Kendra Scott. The chains are adjustable so you can wear it many different lengths. This is great gift idea to stock up on now while they are on sale, too! 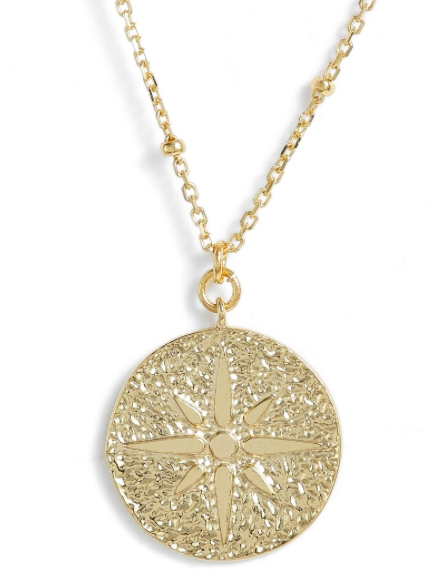 I also bought this MEDALLION NECKLACE. 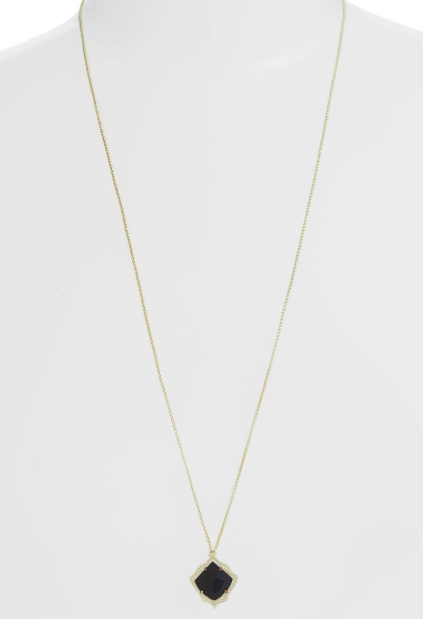 I love delicate necklaces like this to wear with almost anything. So many great cozy pieces this year! I predict that this CONVERTIBLE CARDIGAN will sell out. You can see in the picture that you can wear it two ways - looped around your next for a draped look, or unsnapped as a long cardigan. This cardi is super soft and runs true to size. Another must have cozy piece is a BAREFOOT DREAMS CARDIGAN. If you have never worn one of these, what are you waiting for?!? They are a bit pricier than most cardigans I buy, but it is literally the softest and coziest article of clothing I own. These WEDGE SNEAKERS will be my go-to shoes this fall. 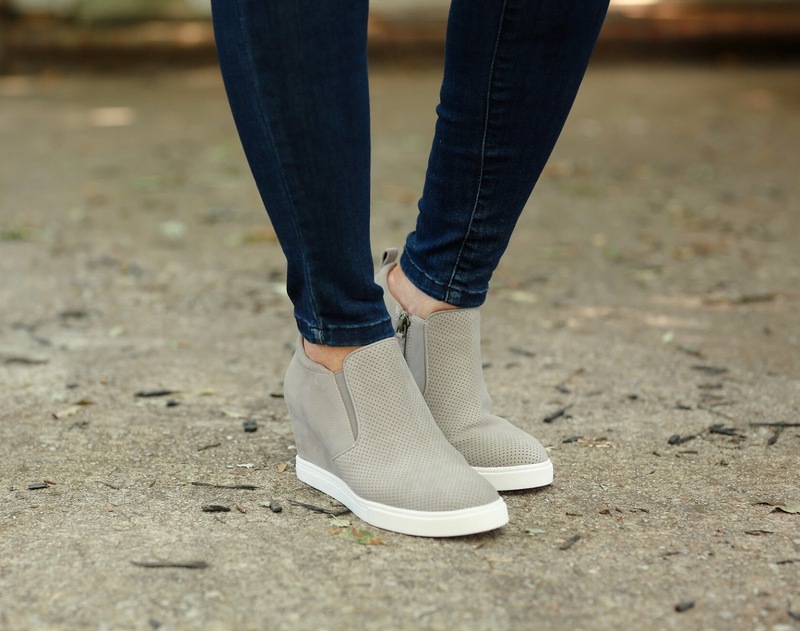 They are a cross between a bootie and a sneaker and are so comfy! This taupe color goes with everything too. I predict these will sell out, especially since they are priced under $60! Whatever style you prefer, there is an over the knee boot or bootie option for you! This is a tough category to narrow down, but here are my top picks. For OVER THE KNEE BOOTS, I love these by Vince Camuto. I have slightly wide calves, so some over the knee boots don't fit me right. These fit over my calves and I think they will go with so much. Even if you have smaller calves, I think these will fit well. THESE OPEN TOED BOOTIES are a great year round shoe. They are comfortable and run true to size. They are $50 off with the sale, so this is a great time to buy! Some similar to these have sold out in previous sales and I predict these will sell out too! THESE STACK HEEL BOOTIES are fun and unique! I love that they have a funkier look and this grey shade goes with so much. They also come in blush which would be a great option too! Definitely predicting a sell out on THIS LITTLE DRESS! This popular dress has been around in the short sleeve version for a while now and is always a top seller. It now is available in this sleeveless version for only $31! It is perfect to wear now with sandals and in the fall with boots and a jacket. Definitely a must have in my opinion! I opted for the pretty green color but it also comes in a fun striped option as well. And did I mention that it has pockets?!? Wow! That was a lot of information. Thanks for sticking with me and I hope this post is helpful in navigating this amazing sale. If you do decide to shop the sale, I would so appreciate it if you would shop through the links on my blog. I will make a very small commission on the items you purchase, but only if they are purchased directly through my links. I only share this because the little bit of income I make from blogging is what allows me to keep running Smart Southern Style and bringing y'all news on all the best deals! Thanks so much for reading along and happy shopping!